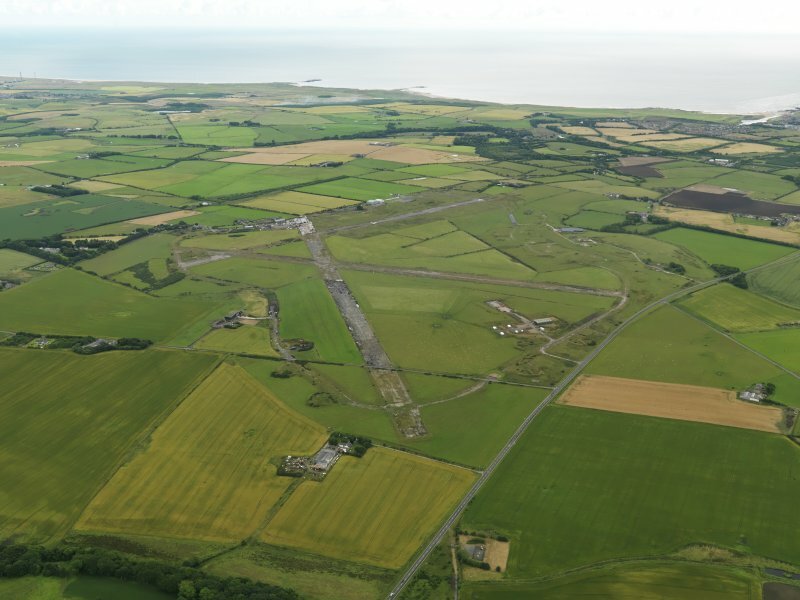 General oblique aerial view centred on the airfield, taken from the ENE. 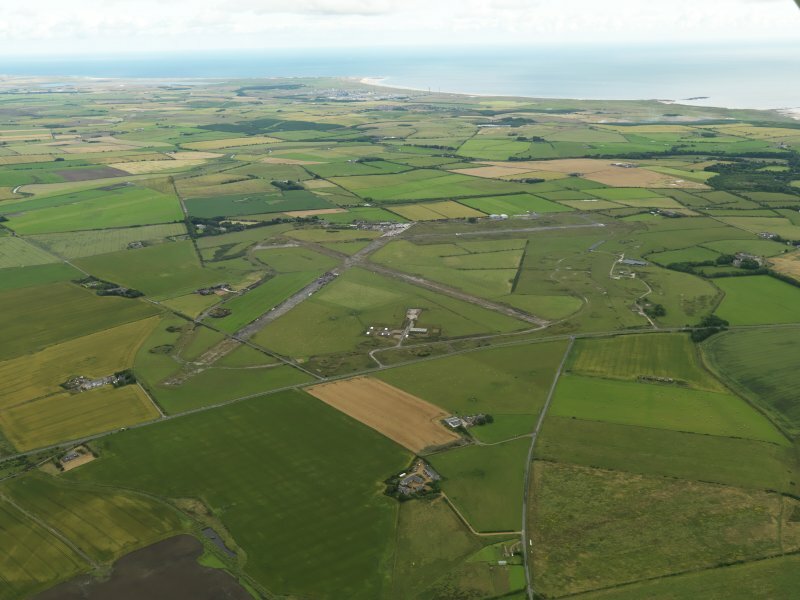 General oblique aerial view centred on the airfield, taken from the N.
General oblique aerial view centred on the airfield, taken from the NE. 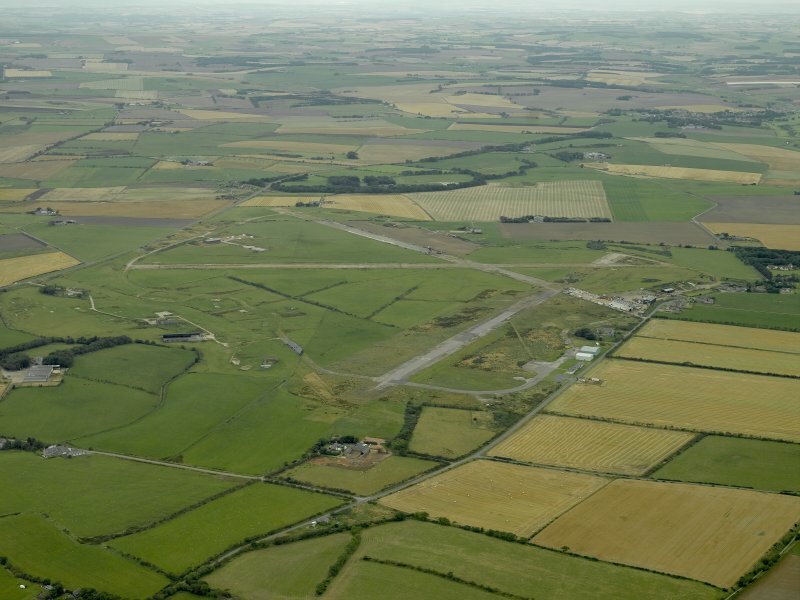 General oblique aerial view centred on the airfield, taken from the NNE. 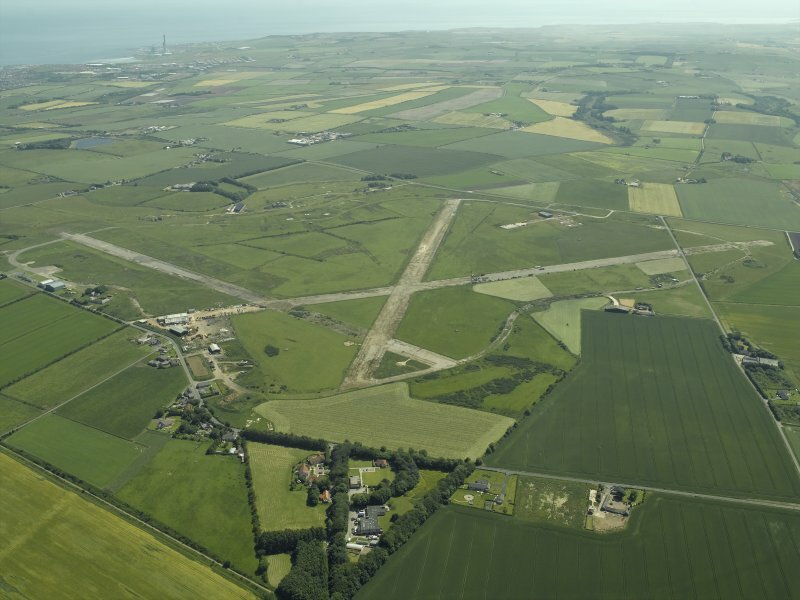 For the Airfield Operations Block see NK14NW 503, for further structures see also NK04NE 22 and NK04NE 23. 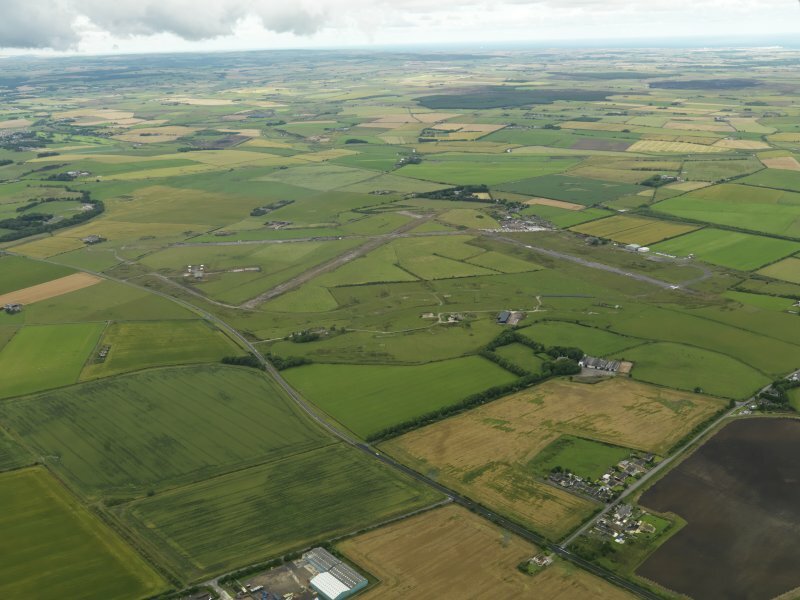 For satellite Peterhead or Cairnbulg airfield (centred NK 040 644), see NK06SW 26. 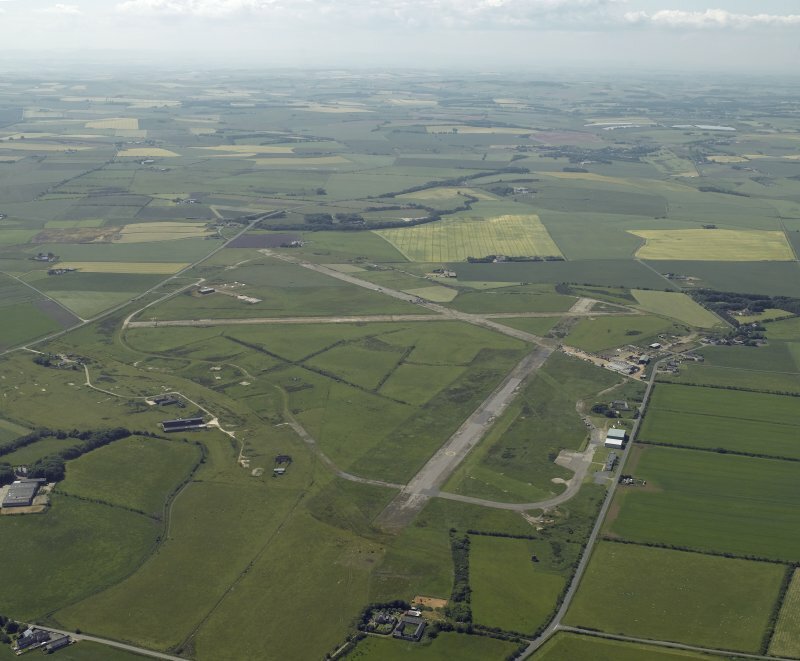 World War II: mainly disused but part of runway used by Bond Helicopters: visible on air photographs AAS/93/15/G32/14-15, flown 11 November 1993. Copies held by Grampian Regional Council SMR. 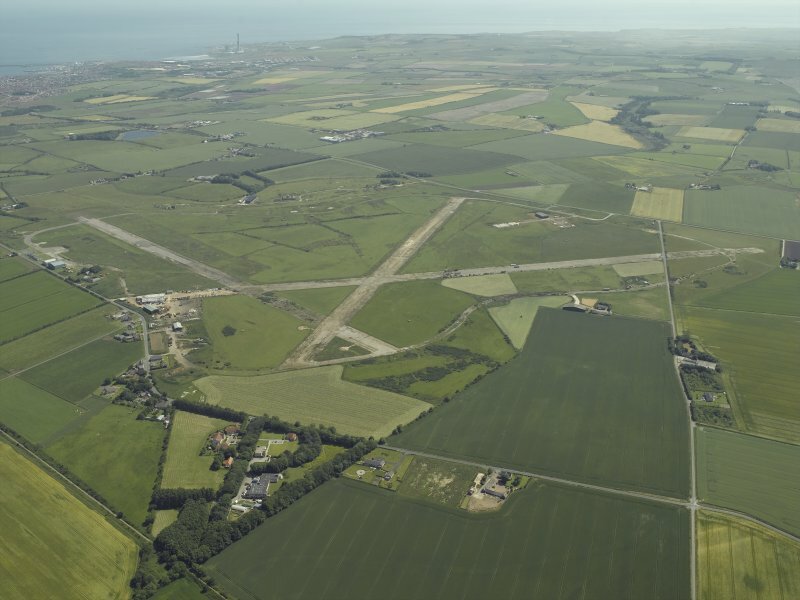 Situated about 4 miles W of Peterhead and N of the A950 road. 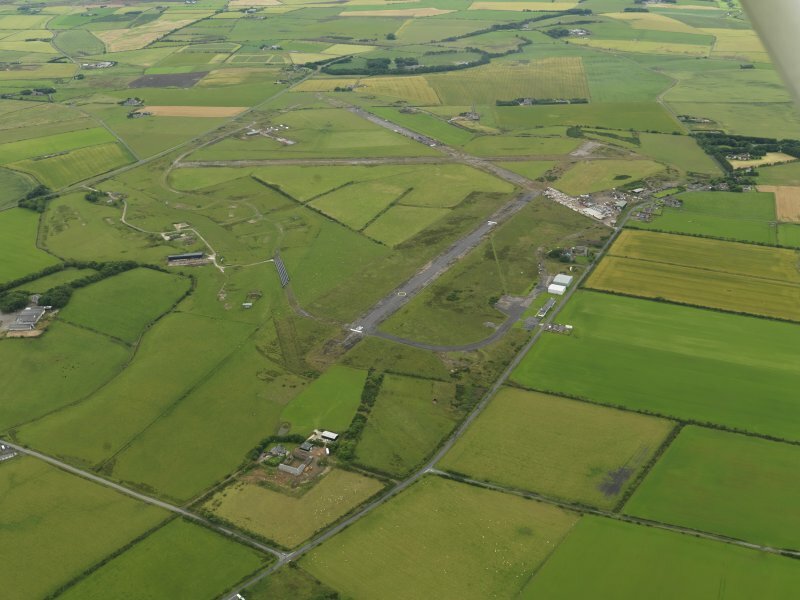 Much of the airfield has been returned to agricultural use whilst other areas have been utilised for industrial estate. Many buildings including pillboxes survive particularly on the E and N sides. The control tower/watch office has been demolished (Smith 1983). 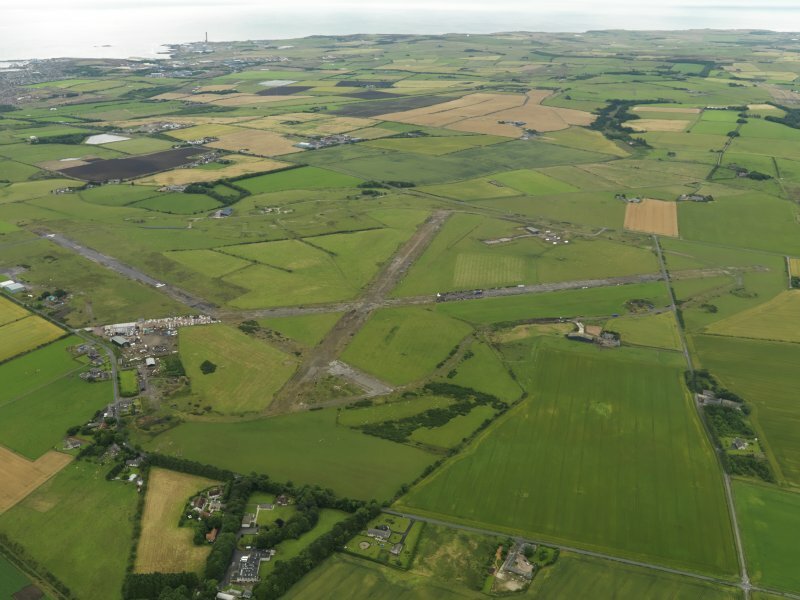 An archaeological desk-based assessment and rapid field survey was undertaken in March 1997 on the proposed route of a pipeline running from St Fergus Offtake Station to the proposed pressure reducing station at Peterhead Power Station. Five sites situated within the corridor examined were listed in the NMRS. The following is amongst the sites identified in the assessment:. Several other enclosures, wells, tracks, field boundaries and dykes were also recorded. Fuller report in the NMRS. Site recorded during a watching brief and excavations undertaken on the route of the pipeline during May and June 1998. The route had previously been assessed (Strachan 1997). Monitoring of the topsoil stripping ensured that damage to known sites was minimal. 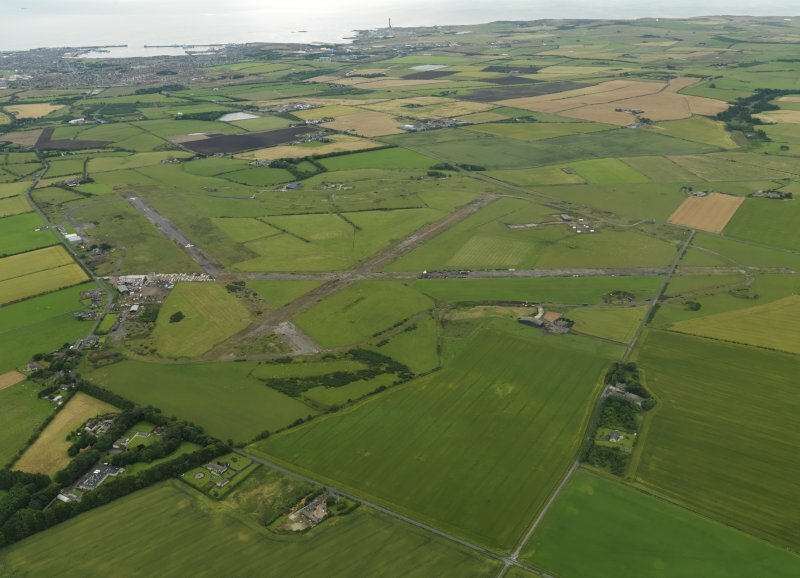 Monitoring within the Peterhead Airfield/Longside Airfield (NMRS NK04NE 12) revealed no sites of archaeological interest. 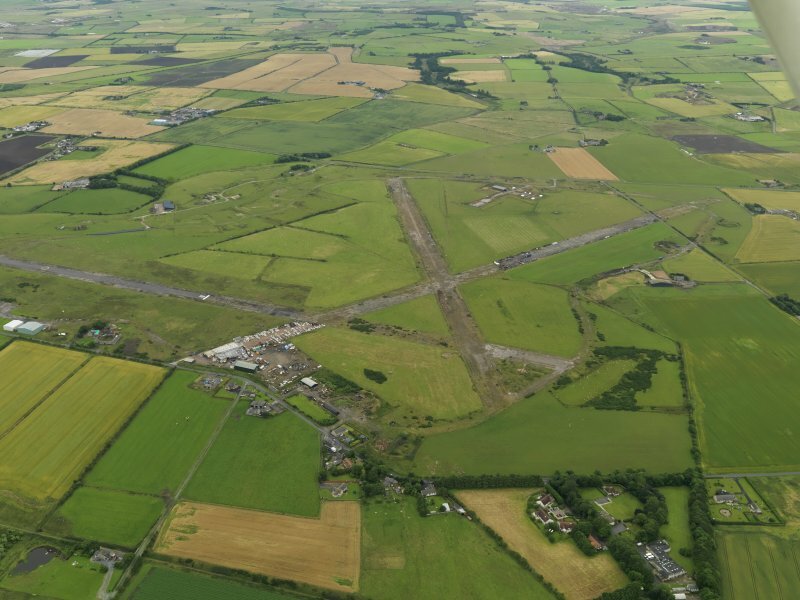 A report has been lodged with NMRS and Aberdeenshire SMR. Sponsor:	Penspen Ltd for Scottish Hydro-Electric plc. 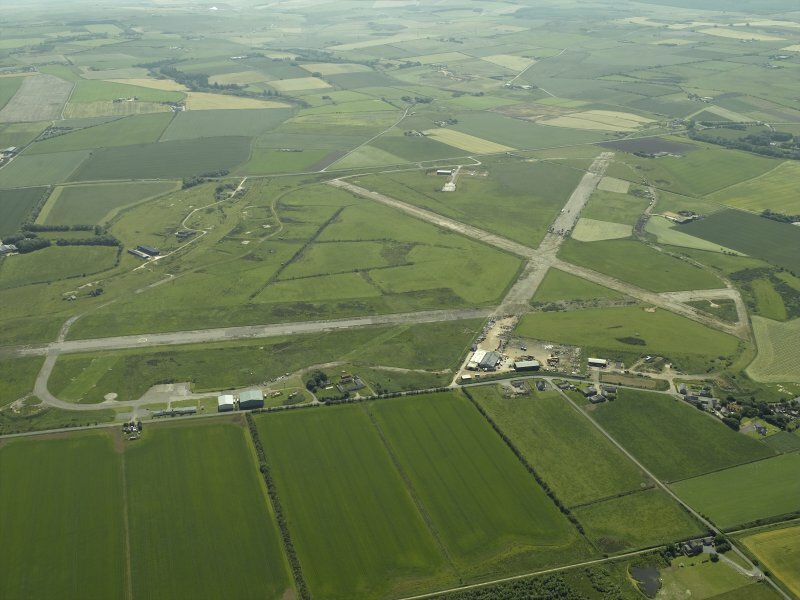 Examination of the immediate postwar RAF vertical air photographs (106G/UK 1125, 3109-3112; 3185-3187 and 4155-4159, flown 15 January 1946) show the almost complete airfield, all of the dispersed accommodation camps and ancilliary buildings. Also visible are several pillboxes, the 'Battle H.Q. and many of the aircraft hangars and dispersal bays. 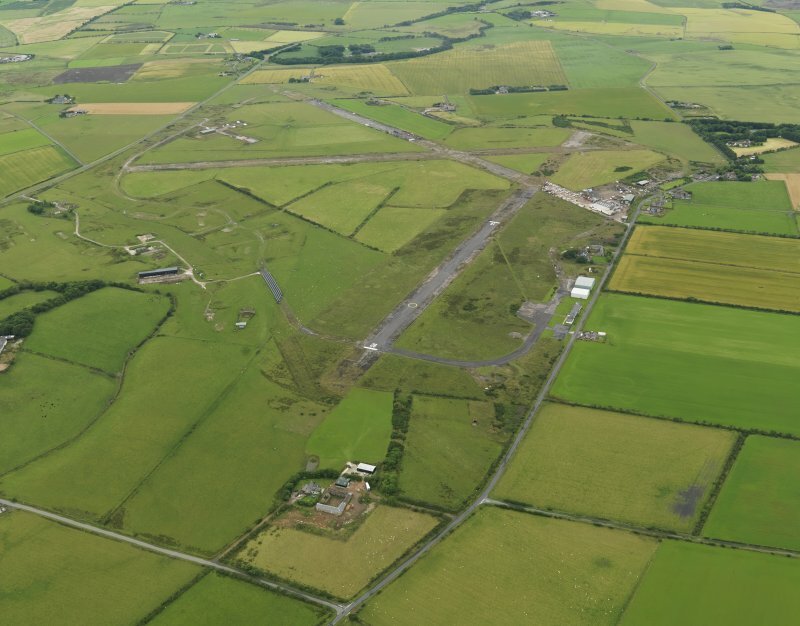 Aerial photographs taken in 1969, (OS 69 176, 59-63, flown 6 June 1969) show that by this date the hangars has been removed, but the dispersed sites still retained many of their buildings and huts.